If you want to go on a bike ride, but your pet isn’t up to it, you can still take them along. Going to the park to give your pet a little fun and exercise? Why not get some exercise yourself, without tiring them out along the way. Track’r has developed its new bicycle trailer attachment to the Track’r pet stroller. The stroller converts from Trailer to back to a Pet Stroller in less than one minute. The stroller features parking brakes, water bottle pocket, parent pocket, security pocket, exterior leash point, water bottle pocket and cup holder. Everything you need to go to the park with your pet. 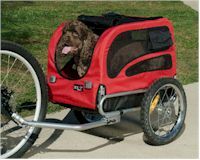 Go to Cat Palace USA to review all the features for your summer bicycle fun in the park.